FAB FINDS & TIPS : Makeup Organization & Storage Ideas! I manage to squeeze a lil time to blog... When i'm stressing out, i browse the web... What else..watching YouTube and reading beauty blog... Since i started collecting makeup, i always try to find the best storage that i can ever done to my makeup... from ordinary closet drawers, to train case, to baskets... none of them are helping me to get neat and organize... year by year watching other YouTube guru show their makeup organization and storage. They are awesome! But i am not the kind of person who love to have like so many makeup that is for me insanely to much for me. For me having 10-15 shades of each type of makeup would be ok! ;p depends on the type too... anyways, makeup expired right? im planning to post a blog regarding expired makeup which had happen to me. A disgusting fungus/algae something2 grows in my eyeshadow! wait for the post ya! So for this amazing date today with my coming new year resolution, i came out with another organization plan. After on the of research for them... i may choose one of them or maybe the best last choice. I hope my dream storage come true! Yes, I need to save. So the first ever drawer that came in my mind was this, inspire by Juicystar07 makeup collection video and some other gurus. What i like about it is the depth of the drawers. so you can never store to much ending up you forget to use them. I think it is a great storage idea because its has a wheel, so i can move it around. why im moving around while doing my makeup? i mean by yeah you know you may not wanna sit up straight like facing the teacher in class, you may move around and cleaning may come in handy. yes, i like the dept of it... the small 8 drawer on top would be home for my makeup items. and the other 4 big drawer, i may store other misc items like hair tools, hair product that are usually big, skin care stuff, mask and others. on top of it, i can put my brushes or perfumes! This have been a very popular trend nowadays. First the high end storage that can cost up to 300usd++ per cabinet called the ClearCube! Saw Kim Kardashian use it in her reality shows called Keeping with the kardashian. Yes... Its custom made as you demand... Then came a dupe called Muji drawer that available and a hot selling item in their online store. You can check it out here - CLICK ME! I personally dont like the clear cube. Because its to big. I like Muji better. Its a reachable size drawer and stack-able and its much more cheaper. But still, its not available in Malaysia. I live in Johor, near to Singapore. I can go to Singapore and purchase them. But I think the price would be 5x higher after converted. Tsk* Tsk* There are a lot more styles, this is what i can only find in their website. I combine the 2 large drawers using Photoshop. on the left is the 5 drawers, smaller than the right one. Aaa~ Sigma brushes on top.. interested? Click here! what i dot like about it its not available in Malaysia. We don't have Muji stores yet. May not fit everything I think. Foundations and big items like powder packaging use to have fits few in the large drawer. While the 5 drawer is a bit smaller. Just nice for lipstick, single eyeshadow, lipgloss and other small items. I think it is a great storage idea because its super stylish! you can see everything inside! so you wont forget to use them its stack able, and the size is just nice! Its quite affordable too! You can add more drawers as you will. This may be my choice due to some reason although there is still some cons about it... It the drawer from IKEA called the ALEX Drawer with castors. 3 small drawer and 3 large drawer... Its huge! Its very wide. The more popular one are the one with 9 drawers like newrulefarah have. what i dot like about it is to wide! if i sit next to it, i may not able to reach the one that on the other side part. I may reach it but i may not be easy... Quite expensive, but I think it will last for years. I wish the have it like this not to wide, and maybe 2 more drawers that makes it 8 drawer. keep the depth height! it is just perfect! I think it is a great storage idea is because its have a castor (wheel on the bottom) which help to move easily. Super stylish! Perfect depth! Can be turn out to be a table. Hey! Its Ikea! Small space isnt a problem right! :) I can purchase this drawer locally! Yeah! We have Ikea here. Or you wanna find out more? Click here! It cost RM469. a DIY furniture. So thats it! My idea and project 101! <3 Next 2012 resolution, perfect skin 101! Till next time! Owh! Dont forget to leave a comment on what you think! or maybe a link to your post about how you store your makeup! i would love to see! I think the ikea is good!!! Some nice divider and nice design exterior it will be perfect!!! Great tips! I love the Muji drawers, I want some! And the Ikea drawers look good too. 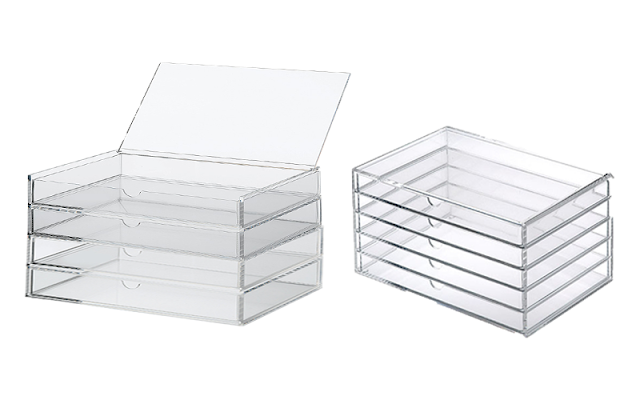 Sure it is our responsibilities to have this have makeup organization and storage idea.